1 Scenario book (color): Originals plus 6 additional including Faliase Gap, Mortain and Operation Totalize. Two full maps; the top halves of which will overlap Maps D & E, taking it just over a half map South. These will be back-printed with mid-map projections for scenarios. 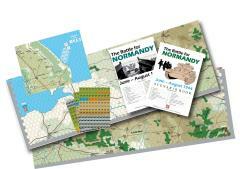 1 8-1/2 x 11" color map section: (Utah Beach area), cardstock.